by Mark Trowbridge, CPSM, MCIPS, C.P.M. 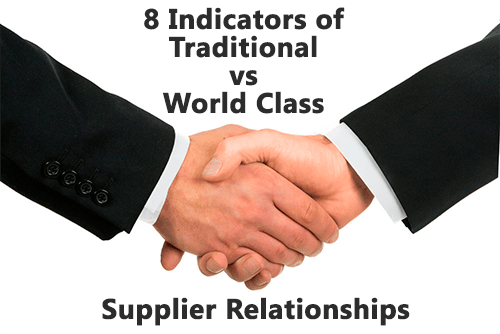 A key factor that often differentiates “World Class” procurement groups from old-time ”purchasing” organizations...is their approach to the supplier relationships they manage. Those that foster supplier relationships as important resources, gain many strategic advantages, such as Higher Service Levels, Continually Improving Product Quality, Secure Sources of Supply, Greater Expense Base Impact and Lower Total Cost. However, Purchasing groups that view suppliers as merely sources for goods & services, often miss these benefits. In our consulting work with supply-chain organizations, determining the quality of their relationships with suppliers can immediately tells us how professional their supply-chain personnel are. 1. Sharing Information Be open with non-proprietary information, especially that relating to volume trending. Hold information "close to chest". 2. Negotiation Focus Focus upon total cost or total value negotiations, which provide fair profitability for suppliers based upon the total value received by the buyer. Focus upon unit prices. Often this can be “penny-wise but pound-foolish”. Buyers who practice this type of methodology often limit their own careers, as they will never progress to managing non-traditional commodity acquisitions like personnel benefits, professional services, marketing collateral materials, information technology systems, etc. 3. Customer Access Entrust key suppliers to communicate with requisitioners & users subject to contractual controls & automation tools (like e-Procurement). Allow the experts to serve your users...especially in transactions where little value can be added by supply-chain professionals. Old-time “purchasing departments” are often perceived as a choke point between users and the supplier. For example, organizations that require hard-copy requisitions be completed and mailed...only to issue a hard-copy p.o. several days later that contains the same information, are doing themselves, their users, and the suppliers great disservice. 4. Trust Establish contractual controls in advance. Install mutually-agreeable control mechanisms. Manage high transaction volume relationships through exception, for example auditing random samplings of invoices. Require management to review and approve every invoice. This will alienate the suppliers, your customers, and the accounting group. 5. Communi-cation Communicate with key suppliers regularly and in a meaningful manner. Have quarterly performance reviews to identify opportunities for improvement. Have senior supply-chain managers & customer directors attend. Communicate only when there is a problem. Deal with issues on a “case by case” basis rather than summarizing trends. Have only lower level personnel interact with suppliers. 6. Entertain-ment Periodically share entertainment expenses. Don’t make it a point to have “extras” be part of the program (they’ll find a way back into the product price the next time around). Adhere to your firm’s policies regarding gratuities. Expect to eat out for lunch regularly at the supplier’s expense. Joke about it being their responsibility. Invite non-involved employees. Drop hints about candy baskets for Festivities. 7. Attitude Be professional, fair, & personable. Recognize human worth and value provided. Praise good performance. Be tough. Show them who is the boss. Don’t commend them when they do something well. 8. Respect Refer to your suppliers with respect. Use terms like “supplier”, “business partner” or “provider” in front of your customer departments and management. Recognize that a supplier is one of the best in their field, and they enjoy being appreciated by their customers. Call them “vendors” (also a good word for someone who sells hot dogs at the ball park...) or “salesperson”. Personally would you rather work for a manager who treated you in the same manner as the supply chain organization in the left column, or the right? Your approach to the supplier community has the same effect. Over time, it will significantly influence the pricing & service levels you receive...and far more. 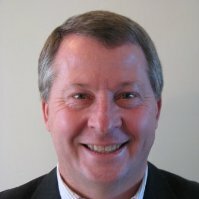 Mark Trowbridge, CPSM, MCIPS, C.P.M. is Principal with Strategic Procurement Solutions, LLC a Strategic Alliance Partner of the Purchasing & Procurement Center. Mark is a True Procurement Expert Who has 30 years in the profession which include senior positions in the Financial, Airlines, and Manufacturing sectors; culminating as Director of Sourcing & Contracting Management for Bank of America! In his last position as Director of Sourcing & Contracting Management with Bank of America, Mark’s team was responsible for sourcing across the corporation’s global operations, and generated savings that exceeded a quarter-of-a-billion dollars. After leaving the corporate environment, Mr. Trowbridge has achieved great success in a large range of supply chain consulting initiatives. He has consistently exceeded targeted savings objectives on large sourcing projects in Services, Manufacturing, and Governmental sectors. Mark has helped to deliver hundreds-of-millions of dollars in cost benefits to clients.